Windermere guest houses and bed and breakfasts in the Lake District. The Ravensworth Guest House,Bed and Breakfast in Windermere Cumbria,the Lake District. This Windermere bed and breakfast sleeps 26 people. Luxurious Licensed B&B in Windermere. Special offers and packages available. 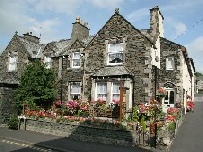 The White Rose,Bed and Breakfast in Windermere Cumbria,the Lake District. This Windermere bed and breakfast sleeps 11 people. Storrs Gate House,B&B in Bowness-on-Windermere Cumbria,the Lake District. This Bowness-on-Windermere bed and breakfast sleeps 14 people. 4 star gold award winning B&B in Windermere. 12 en-suite guest rooms. Free access to nearby leisure spa. Windermere lies at the heart of the Lake District. Please browse the selection of bed and breakfasts below. Click the links for more details on individual B&Bs. Alternatively browse the nearby areas for other guest house accommodation. Nearby towns and villages include Bowness-on-Windermere, Ambleside , Newby Bridge , Hawkshead and Coniston. The Ravensworth offers high quality bed and breakfast accommodation in an ideal position in Windermere, in the heart of the Lake District. Luxuey B&B accommodation available including four poster beds. All rooms en-suite. 15 minutes walk from Lake Windermere.